- KATHLEEN ALAPE CARPENTER: THE VERY BUSY MUSEUM - A CONVERSATION WITH ERIC CARLE - Teachers.Net Gazette - STRESS RELIEF, STUDENT MOTIVATION, ORGANIZATION IDEAS, CLASSROOM MANAGEMENT, LESSON PLANS, DISCIPLINE, AND MORE - featuring columns and articles by top names in education and your teacher colleagues around the world! The Teachers.Net Gazette is a clearinghouse for teacher writing, from well-reasoned education essays to teacher prose, poems and humor! Bookmark the Teachers.Net Gazette and tell a friend! Gazette Editor Kathleen Carpenter was invited to a pre-opening tour of the Eric Carle Museum of Picture Book Art and spent some time one-on-one with its co-founder, Mr. Eric Carle. Eric Carle flung out his arms as if to hug a beloved but invisible friend. "When I talk to groups of children I ask them to tell me about their friends and they talk away and throw their arms around each other." The prolific author and illustrator of more than 70 books was explaining why Do You Want to be My Friend? is the book and the message for which he most wants to be remembered. "Friends. Adults have friends, lovers, companions. We make a big thing of our friends. But friendships are also very important to children." Carle's voice grew softer as he recalled the letter his 6 year old friend sent to little Eric 67 years ago after the Carle family moved from New York to Germany. "I miss you. When are you coming back?" "Imagine, only 6 years old, and he wrote that to me," he said with wonder and nostalgia. 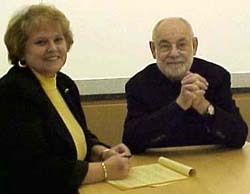 My interview with Eric Carle took place in a small room inside the Eric Carle Museum of Picture Book Art in Amherst, Massachusetts, three days before the November 22, 2002 grand opening. The 44,000 square foot facility is the permanent home for a very famous and very hungry caterpillar and will be visited by the work of other storybook artists from around the world. When he learned that I am a former teacher writing for teachers, Eric Carle extended his hand toward me to emphasize, "Please, I must say this." Speaking with emotion he said, "Teachers are the most important people, they have enormous power of good and evil." In his soft and slightly accented voice, the internationally known and beloved author-illustrator recalled his experiences with teachers who exhibited "good and evil" during his earliest school years. One he considers pivotal in his development as an artist. "Miss Frickey," he pronounced with reverence. She was the "good" first grade teacher who praised and encouraged little Eric's artistic endeavors in her Syracuse, New York classroom. It was Miss Frickey who called his mother to the school, alerting her to the child's special talent and the importance of nurturing that talent. Carle's gratitude was obvious as he spoke fondly about this early teacher, recalling with breathless wonder the thrill and "awakening" he experienced when first given the opportunity to explore the beauty of watercolor on paper, speaking as though he was reliving the experience right there in the small conference room of the museum which bears his name. Millions of fans past, present, and future can be grateful that Eric Carle continued his pursuit of art in spite of the negative experience of the second grade teacher who caused him to dislike school. "She was mean, and she used corporal punishment," he said, raising his hand to demonstrate the threat of such punishment, the same hand that magically turns tissue paper and paint into enchanting works of art. At one point during the day, Carle repeated the word "beauty" three times in one sentence. I asked him what in his life had cultivated such reverence for things beautiful, and the passion to create beauty through art. "Ahh, the walks with my father, looking at the beauty of the countryside. The flowers, the trees, all of the beauty surrounding us. Beauty is the center of life, and it is everywhere in nature. When one person shows another person something of beauty, they both become full humans." Though he never worked as an artist, the elder Carle had a talent for drawing and often entertained little Eric with drawings, especially of little animals, similar to the many small creatures found among the characters in Eric Carle's picture books. And Eric's mother always lived up to Miss Frickey's instructions to nurture and encourage her son's talent. I asked Eric Carle if he was aware of the trend toward eliminating the arts from the curriculum in many schools. He indicated that he is sadly aware. "My hope is that the museum will help to fill that hole." And according to founding director Nichols B. Clark, "No one [who visits here] will flunk museum-going." Clark spoke of making this museum one that asks, "not, 'How smart are you?" but "How are you smart?'" He and the staff are determined that the museum will celebrate more than one very famous children's book author and illustrator. 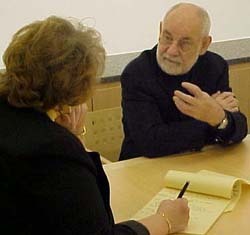 However, Eric Carle will appear regularly at the museum to present programs and meet visitors. The realization that having his name attached to the museum would benefit its mission is what convinced Carle to allow it to be called the Eric Carle Museum of Picture Book Art. "I wasn't going to have my name on it, but�" he said, hands splayed in a gesture conveying resignation. Not his first choice, but it made sense for obtaining support and attention for the project. "I have been very lucky and many people have been kind to buy so many of my books. I did not want this to be a monument to me, but to all my colleagues and artists. I've been successful and I want to give something back. I hope that doesn't sound corny." Giving back included a substantial donation by the Eric and Barbara Carle Foundation, supplemented by funding from corporate and private donors. And judging by the frequency of his hard-hatted appearance in a video of the museum's physical evolution, he contributed a generous amount of time to overseeing the construction. The Eric Carle influence is visible immediately as one enters the museum. 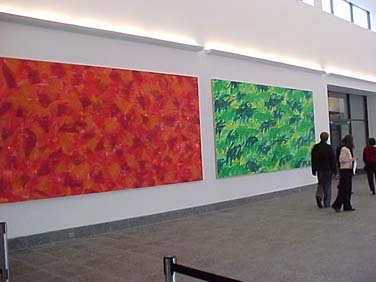 Natural light flows in through huge window walls and is further illuminated by mural size reproductions of the colorful end papers found inside the covers of Eric Carle's books. The central hall displays Carle created murals. Radiant heat makes the floor comfortable for children when they sit for stories and programs, or just to enjoy their surroundings. The three galleries off the main hall will showcase more than framed original art from works such as The Very Hungry Caterpillar, The Very Busy Spider, and The Grouchy Ladybug. While 1,200 original works donated to the Museum by Eric Carle form the cornerstone of the institution's permanent collection in rotating exhibits, the museum will feature exhibitions by four guest artists each year. Currently the work of Maurice Sendak is featured, with one section of the display demonstrating the influence of the likes of Albrecht Durer and Winslow Homer on Sendak's development as an artist. Following the Sendak exhibition will be the work of Nancy Ekholm Burkert, illustrator of James and the Giant Peach and the 1973 Caldecott Honor Book Snow White and the Seven Dwarfs. During late April 2003 the Museum will host the American tour of the acclaimed Japanese picture book artist Mitsumasa Anno's career retrospective, followed by the work of Dutch-born author and illustrator Leo Lionni. For those who wish to apply more than their eyes to art, a studio staffed by a professional artist/art teacher offers hands-on activities. Stacks of tissue paper, pots of paint, glue and other tools of the artist await the inspiration of visitors of all ages. The studio will also host special demonstrations and workshops, providing participants with the opportunity to learn about and experiment with various media and techniques employed by featured artists. The cozy 130-seat auditorium will host performances, films and lectures by visiting artists and scholars. A warm and well-stocked library provides a comfortable setting for reading picture books and listening to stories. And for very hungry visitors, a caf� offers simple and healthy fare, while a museum shop is chock full of picture books, art materials and a variety of creative gifts. The auditorium and library will host workshops for teachers, further developing their expertise in the use of story book art for instruction. Editor's note: When I entered the restroom, an involuntary squeal of delight escaped me and I looked around sheepishly to be sure I was alone. I wished my former kindergarten students were here with me. 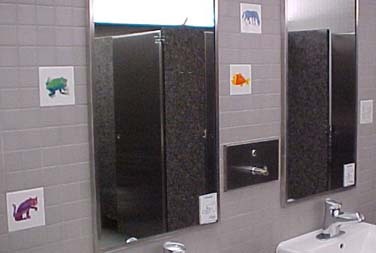 The lavatory walls are punctuated with painted tiles depicting characters from "Brown Bear, Brown Bear, What Do You See?" Even the restroom walls will delight fans of Eric Carle. "I have long dreamt of a museum for children and families, educators and scholars--for everyone interested in the art of the picture book," said Eric Carle. "Our hope is that this museum will be a celebration of creativity, a place for learning and enjoyment, and a salute to picture book art from around the world." 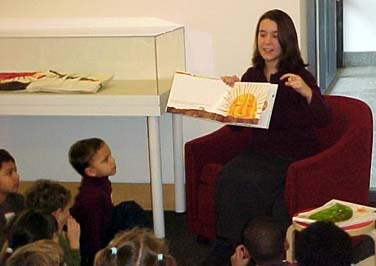 Megan Lambert reads to a group of visiting Kindergarten students.